As one of the youngest companies in the luxury watch industry, Franck Muller has been in operation for a mere two decades. Still, the watchmaker has risen to the challenge to become a key player in today's watch market. As a child, Muller spent his time dismantling and reassembling any watch that he could find. His interest then turned to restoring timepieces for collectors and soon he was creating his own designs. By 1992, Muller had accomplished 21 world premiers and filed for four patents. Though a young company, Franck Muller has already achieved great success in the watchmaking industry. * Franck Muller designs every single movement himself - regardless of how complicated or simple. * The Muller collection is a favorite amongst celebrities. The likes of Elton John and Robin Williams are often seen sporting a Franck Muller. * Muller is a self-described "Master of Complications." Each of his masterpieces is seen to have numerous complications each, leading customers to see his statement as one of simple accuracy, not arrogance. 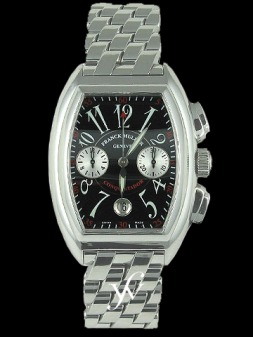 Chronograph This fashionable chronograph watch is Swiss made of stainless steel and a quality Japan automatic movement. It features a white dial, 3 sub-dials (for day and night, seconds, and date), and a stainless steel bracelet. The back is solid with markings and engravings, while the mineral crystal glass face resists scratches better than regular glass. Color Dreams The pearl dial set against the stainless steel bracelet provides an elegant and artist touch to this watch. The oversized numbers are featured in a colorful array, giving the image of a pop art jewelry piece rather than a timepiece. It features a skeleton back with all markings and engravings. Conquistador Cortez King An ingenious combination of art and craftsmanship yields the Conquistador Cortez line. The King model has a chronograph with two counters; its sunburst dial and clear lacquer finish sets off the luminous numbers. This watch is available in a wide range of colors: white, black, blue, burgundy, green, grey, bronze, sable, pastel blue, pastel green and pastel pink, with a hand-stitched crocodile strap in matching colors. Alternatively, each of these dials is available in a hand-stitched black or white rubber strap.